In her opening remarks, Dr. Judy Olsen recalled fond memories of the service of the Peace Corps in Sierra Leone, and disclosed that most of the Peace Corps volunteers who served in the country always wanted to return and rekindle their strong attachments and love for Sierra Leone. She said that she was pleased to make the disclosure to Vice President Sam Sumana after due consideration of all the issues involved. Dr. Olsen also said that she and the Peace Corps were highly honored by the visit of the Vice President and team and presented Chief Sam Sumana with an engraved plaque to commemorate what she described as a historic visit. Dr. Judy Olsen concluded by saying that the announcement for the return of the Peace Corps to Sierra Leone in 2010 was official, and that her office will be making their own official announcement shortly. Peace Corps /Sierra Leone suspended their operations as a result of the National Provisional Ruling Council (NPRC) coup d’etat in April, 1992. Eighty two of the volunteers serving at that time were evacuated, but in August, 1992, twenty four of the volunteers returned to Sierra Leone and reinstated the health, agricultural and education projects. However, due to the continued instability in the country at that time Peace Corps/ Sierra Leone ceased operations in 1994. 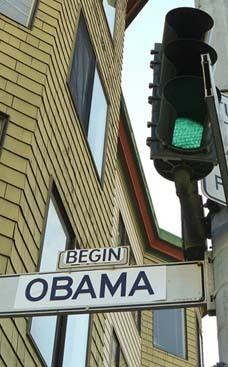 - Thursday 18 June 2009. 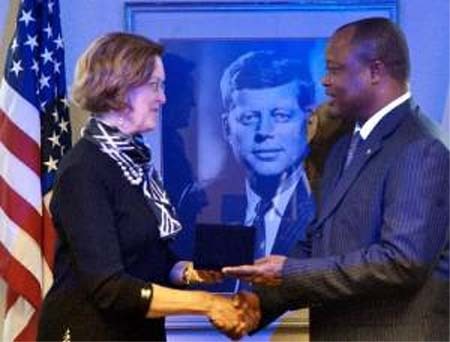 According to a press release from the office of the Vice President of Sierra Leone, the acting Director of the United States of America Peace Corps Service, Dr. Judy K. Olsen has disclosed that modalities are being put in place for the Peace Corps Service to return to Sierra Leone in 2010. The good news was disclosed at a meeting between Dr. Judy Olsen and Vice President Sam Sumana held at the United States Peace Corps office in Washington D.C. on Tuesday June 16, 2009. In her opening remarks, Dr. Judy Olsen recalled fond memories of the service of the Peace Corps in Sierra Leone, and disclosed that most of the Peace Corps volunteers who served in the country always wanted to return and rekindle their strong attachments and love for Sierra Leone. She said that she was pleased to make the disclosure to Vice President Sam Sumana after due consideration of all the issues involved. Dr. Olsen also said that she and the Peace Corps were highly honored by the visit of the Vice President and team and presented Chief Sam Sumana with an engraved plaque to commemorate what she described as a historic visit. Dr. Judy Olsen concluded by saying that the announcement for the return of the Peace Corps to Sierra Leone in 2010 was official, and that her office will be making their own official announcement shortly. In response, Vice President Sam Sumana thanked Dr. Judy Olsen for what he described as the best news of his visit to the United States and assured her that he will pass on the good news to President Ernest Bai Koroma in the shortest possible time. Vice President Sumana assured the Acting Peace Corps Director of the Sierra Leone Government’s full commitment to facilitate the speedy return of the Peace Corps to Sierra Leone, and upon their return to ensure that their operations are carried out smoothly. Accompanying the Vice President to the meeting were the Minister of State in the Office of the Vice President, Leonard Balogun Koroma, the Deputy Ambassador to the United States Alahji Ibrahim Conteh, and the First Secretary, Mr. Sheku Massalay. The Peace Corps was established by President John F. Kennedy on March 1, 1961 and since that time more than 182,000 Peace Corps volunteers have served in more than 138 countries, including Sierra Leone. The first group of Peace Corps volunteers arrived in Sierra Leone in 1962 and throughout the 1960s Peace Corps /Sierra Leone (PC/SL) focused on education. From the late 1960s to the early 1990s Peace Corps in Sierra Leone expanded their programmes to incorporate the agricultural and health sectors. The agricultural sector focused on resource management, rice production and wildlife preservation, while in the health sector, the focus was on health education, rural water supply and sanitation. Peace Corps /Sierra Leone suspended their operations as a result of the National Provisional Ruling Council (NPRC) coup d’etat in April, 1992. Eighty two of the volunteers serving at that time were evacuated, but in August, 1992, twenty four of the volunteers returned to Sierra Leone and reinstated the health, agricultural and education projects. However, due to the continued instability in the country at that time Peace Corps/ Sierra Leone ceased operations in 1994. Continued efforts to return the Peace Corps to Sierra Leone was made by Government officials, the Sierra Leone Embassy in Washington and various organisations culminating in yesterday’s disclosure to Vice President Sumana.